With our newly-formed additional team in London 6, Hammersmith HEDGER (named for the late, great Ken Hedger), we faced the prospect of a League 6 Derby for the first time in a long time. In the cauldron of Lytton Hall our two teams faced off in their opening game of the new season. Our Hedger team saw club stalwarts Robin Lee, Nick Rutherford, Mike Mackenzie and Dan “Ruggers” Rugman face a slightly less well established ensemble with new captain Rich Wingfield, Chris “CJ” Moore, Andy Routledge and Shaun Gordon (sporting a fine fedora) in his first competitive outing for Hammersmith. Great to have our new faces on board representing the club! Top board saw a hard fought game between Robin and Rich. 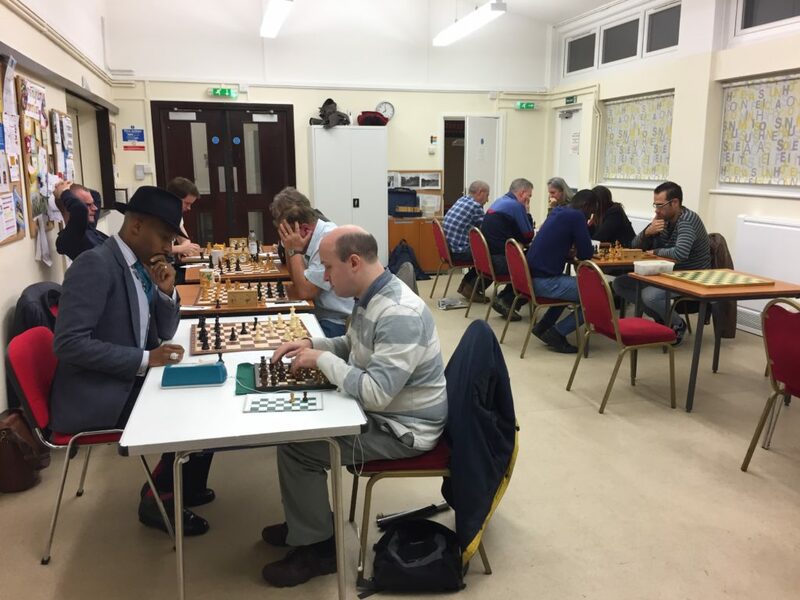 Two players who’ve been on great form of late, Robin edged the encounter with Rich under time pressure and in the face of a beautiful Queen sacrifice. A good game. Chris and Nick played out a draw on board two; probably a fair result in the end. Andy managed to get the better of Mike thanks to some aggressive attacking play leaving Mike’s king isolated. A good result for the big man. On board four Shaun was a late (and unexpected) replacement – probably not ideal preparation for his first game for the club! Facing Dan, he played a very respectable game, eventually succumbing with Dan taking a deserved win. A great match by all concerned, and particularly pleasing that our new Hedger team opened their account with a victory. A fitting tribute to Ken. It’s always a pleasure to realise that your opponent’s 200-graded captain is stepping-down to make way for other players. Less pleasant to realise that half of the players you’re up against are under 13 years old!! 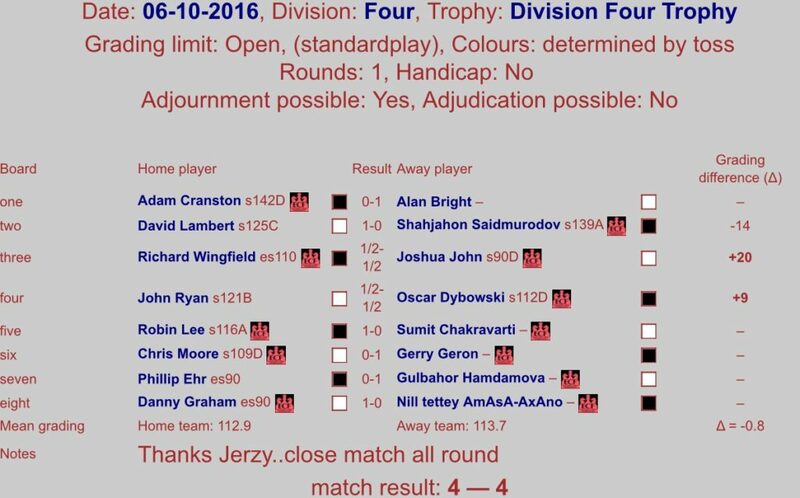 It was a pretty close match all-round with a draw feeling like the right result. Adam and John were the last to finish; both had extremely tight games with Adam finally getting edged in a Rook vs Bishop endgame. John’s draw ultimately meant that we ended the night with honours even. He was up on material but faced into a pair of bishops locked together ominously. The games on boards 6-8 seemed to be played at breakneck pace. By the time I drew breath to look up and walk around, the tables were clear and the boards put away. My commentary on these games is limited, but Phil was cursing himself in the Shakespeare for allowing a fork on f7. Always next time. A special word must go to Danny Gordon – for not only making his debut but for starting with a win. Well done – long may it continue. Board 8 – Danny Graham vs. Nill tettey AmAsA-AxAno??? Might be worth having a word with the league sec. about that one! Spotted my error and have fixed on the website!